A California Beach Wedding in Malibu is a truly picturesque event. With 21 miles of coastline, Malibu’s beaches offer multiple areas to make any California Beach Wedding a day to remember. Malibu is a popular beach city in Los Angeles County, California and it is situated 30 miles west of Downtown Los Angeles. A Malibu wedding gives couples a spectacular view of ocean, sea-washed sand, and a sun-soaked day on the coast. In this picture from a California wedding, the couple is standing side-by-side for one of their portraits as newlyweds. 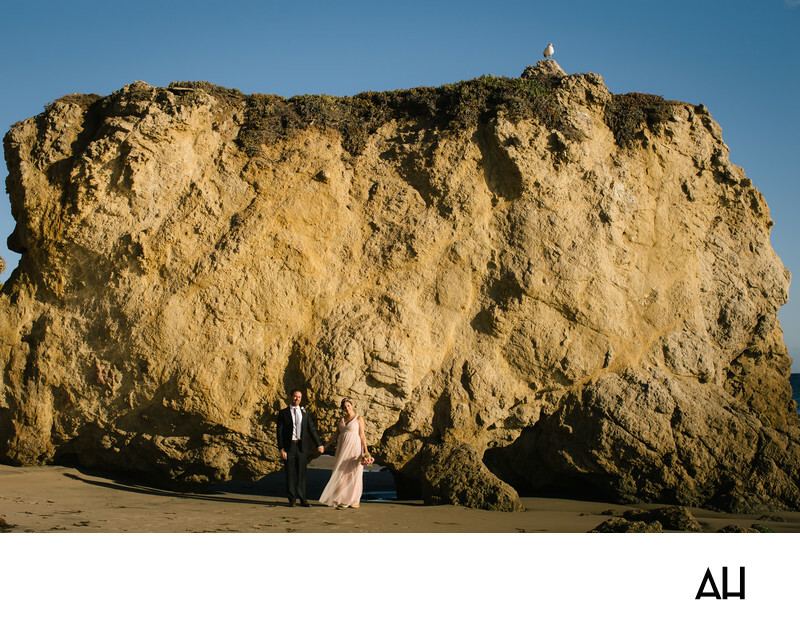 This scene is mostly taken up by the large rock formation that looms up behind the couple. The rock is one of the marvels to be found on the beaches of the Pacific Coast. The rock is enormous, and a feat of nature. It is the color of the sand that it stand upon, creating an interesting backdrop for the bride and groom. At the top of the rock a seagull sits calmly on its moss covered surface, looking out at the ocean. At the bottom of the rock, the newlyweds hold hands and smile in the California sunlight. They stand a little bit apart from one another, but next to them their shadows flow together to form one long silhouette. The groom’s black suit and the pale, blush colored gown of the bride are highlighted in the glow of the sun as it bounces off the rock behind them. Surrounding the rest of the beach scene is a bright blue sky, with not a cloud in it. It is a perfect day for a wedding celebration.